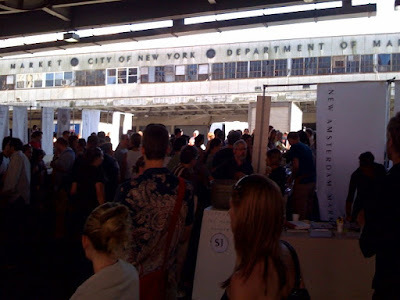 I got a taste of delicious local food at this open air market where the old Fulton Fish Market once called home. Pasture-raised dairy from farms like Hawthorne Valley, Painted Goat Farm, and Valley Shepherd Creamery; natural meats from Fleisher's and Dickson's; and other tasty treats from the like of Marlow & Sons, Stone Barns, Saltie, and Hot Bread Kitchen filled the stalls, doling out samples and food for purchase. A couple of newcomers included Maple Hill Creamery and Basis, a healthful/local/affordable food market coming soon to 14th Street in Manhattan. 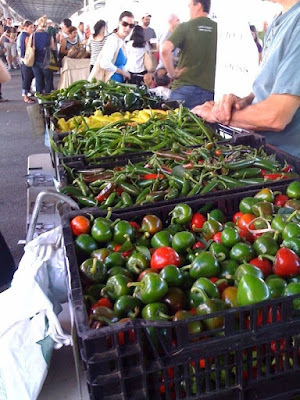 Three more opportunities are coming up for you to get in on the scrumptious action: Sundays October 25, November 22, and December 20. Get the details. Conceived and curated by Renny Ramakers, co-founder and director of Droog, as part of the NY400 week celebrations, commemorating the 400th anniversary of the arrival of the Dutch to New York. Pioneers of Change highlights a more responsible and sustainable approach to living by celebrating the blurring of low- and high-brow, establishing new collaborations, encouraging involvement, emphasizing sustainability and valuing handcraft and the local context. Designated as an official Quadricentennial Ambassador by the State of New York. 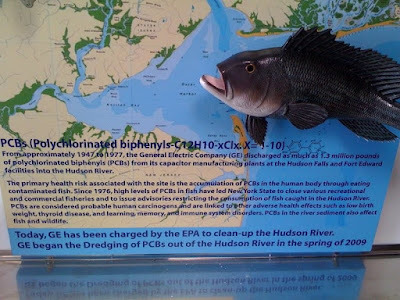 I happened upon The Urban Divers Estuary Conservancy's Enviromedia Mobile Museum yesterday in Red Hook (after hopping on the free water taxi to Ikea). 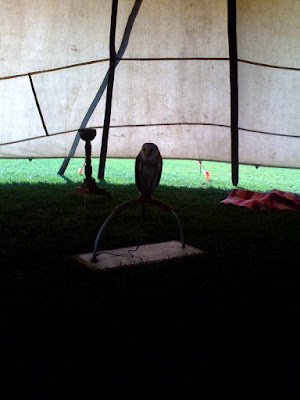 What an impressionable display complete with tepees, information on falconry, info about threats to native wildlife and health, and a live barn owl! The Enviromedia Mobile Museum will be back at Erie Basin Park (next to Ikea, one of the sponsors) on October 10th. But if you can't wait that long, here's their full schedule. Deep breath in... and out. 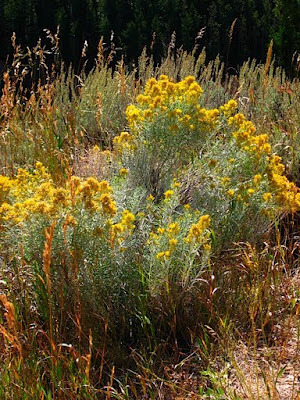 The smell of pine and sagebrush. The feeling of rock and dirt beneath my boots. Sharp mountain peaks, bright midday sun, glimmering glacial lakes. And the sounds: call of the magpie, chirping of chipmunks, gurgling and whooshing of mountain streams, crackling of moose footsteps. This is the experience of a national park. 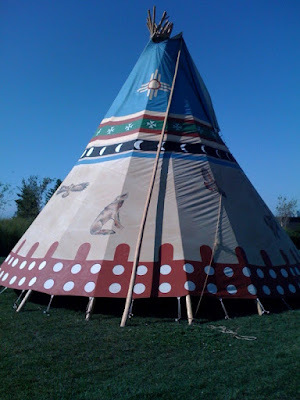 I am grateful to those who had the foresight to preserve these places. I am thankful that I've had the opportunity to visit them. 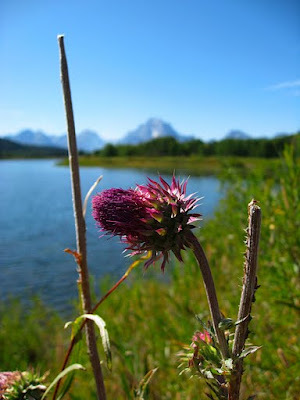 Here's some of what I saw on the latest trip - to Grand Teton National Park in Wyoming. 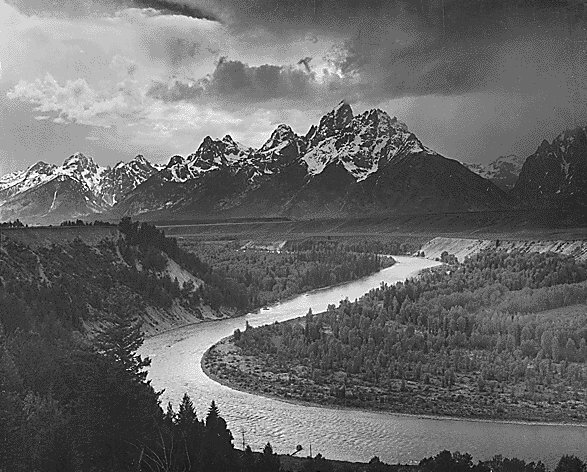 Didn't realize at the time that this was about where Ansel Adams snapped a famous photo, I think he was a bit further upstream. 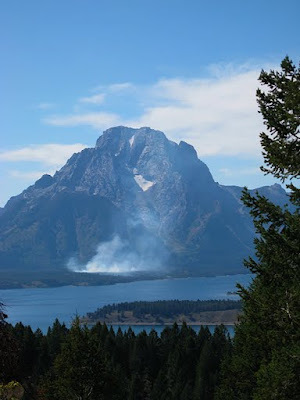 A forest fire burns at the base of Mount Moran. Fires are most often started by lightning and are closely monitored while they are left to burn. 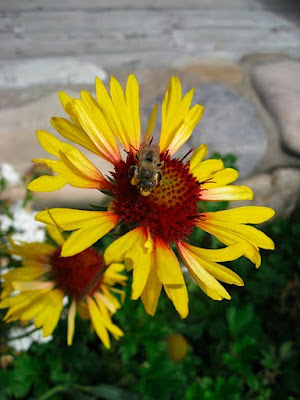 They are beneficial to many plants, such as lodgepole pine. 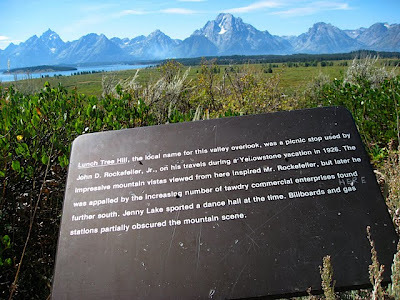 Mount Moran has a distinctive geologic feature -- a basalt (molten rock) intrusion. 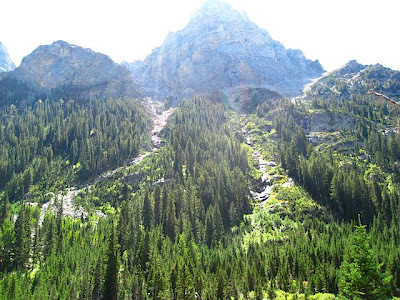 Cascade Canyon Trail, an 11-mile hike (or 9 if you take the boat across Jenny Lake both ways, 13 if you skip the boat altogether) with breathtaking views. Glacial till from the last ice age. 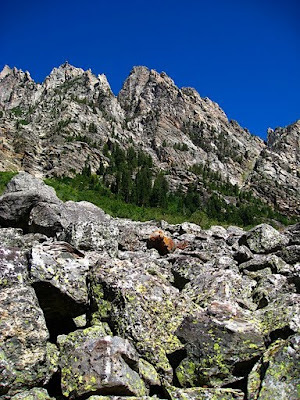 We looked for marmots among the rocks, but they happen to be hibernating already. 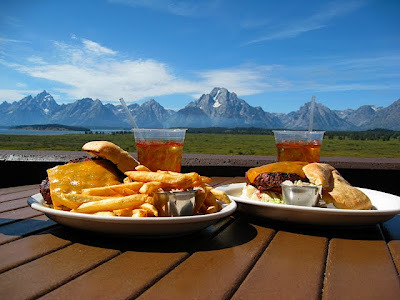 Part of the park's "sustainable" menu: elk/bison burgers at Jackson Lake Lodge. 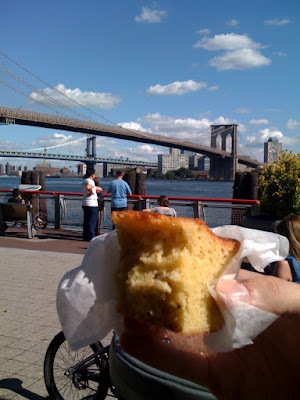 They were delicious, and so was the view. This view inspired JD Rockefeller, Jr. to preserve this place as part of the national park. Mama and baby moose (called cow and calf, respectively), on the appropriately named Moose-Wilson Road. Papa moose (or bull), seen on the Cascade Canyon trail. 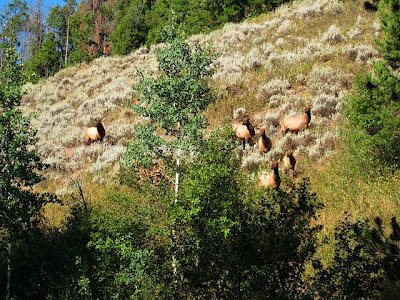 An elk bull and his harem. 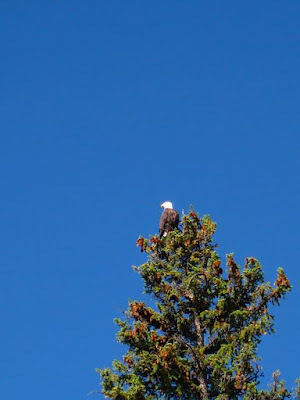 One of 5 or 6 bald eagles we encountered on the trip. They like to hang out by waterways, like the Snake River. A "least" chipmunk. Tiny and adorable. 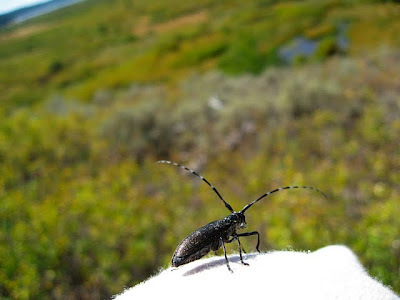 This may or may not be an Asian longhorn beetle. If it is, I'm sorry I didn't report the little bugger (I didn't know they frequented these parts). I was too busy trying to get this shot as he was perched on my shoulder. Leafy spurge, I think. 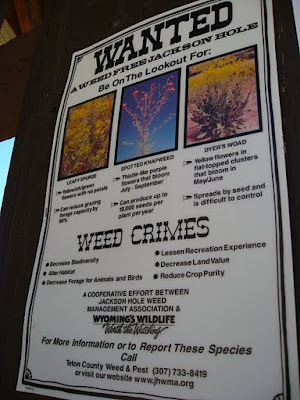 One of the wanted weeds. 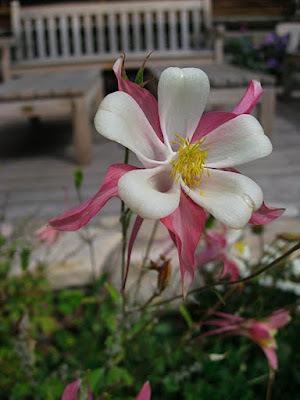 This one's not a weed, it's a columbine. Hot air balloons launched right near where we are staying (Teton Village). 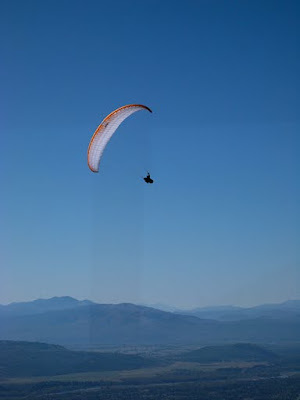 If we were staying one more day, I think I might have wanted to try paragliding. 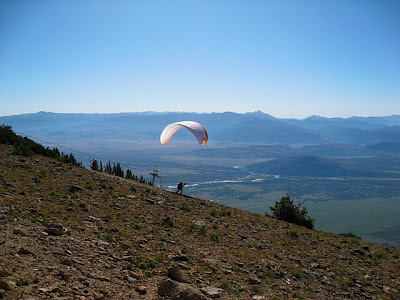 We watched this guy take off from Rendezvous Mountain.